Not all math hides from the sun. Ireland's Enemies uncage technical guitarwork from esoterica, marrying it to lighter sounds to play what they call "mathpop". This new-minted hybrid combines Lightning Bolt jitters with spacey Hum tone, then winds it all through an Animal Collective kaleidoscope. "Executive Cut", which features guest vocals from The Cast of Cheers's Conor Adams, arrives as the second single off of Enemies' sophomore album Embark, Embrace. Rather than fester in complexity, the tune smooths out its own wrinkles as it mushrooms to its finish. This is summer music for guitar nerds, an easy vibe from tricky riffs. 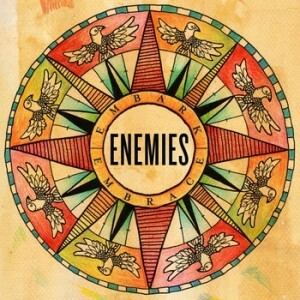 "@earmilkdotcom: #EARMILK : Enemies – "Executive Cut" Not all math rock hides from the sun – http://t.co/qNRCSJnSgD"